Back to A Special Occasion Inc.
14 Reviews for A Special Occasion Inc.
Connie was a pleasure to have decorate for us! She was knowledgable, fun, and fast responding to all emails. I reccommend her decorating services for anybody's wedding! Thank you so much for the nice review...It was a pleasure to meet you and Chris and to help make your Special Day a wonderful memory. We look forward to working with you in the future....baby showers?? anniversaries?? 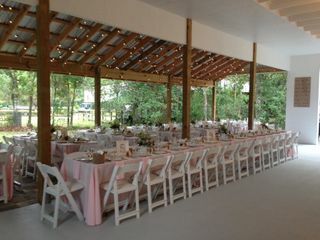 Most reasonable cost for wedding ceremony chairs, Connie is so sweet. Thank you for complimentary review. It was a pleasure to work with you...and we wish you all the best!!! Connie was so helpful on decorating ideas. She went above and beyond to make my daughters wedding special. I will recommend her to everyone in need of a decorator and would use her again. Prices were very reasonable and the quality was great. Thank you Connie for everything. Thank you so very much for your review!! It was a pleasure to meet all of you and to help make this special day a wonderful memory for you. We look forward to working for you in the future!! Mrs. Connie did an amazing job making our wedding vision come a reality! We were super impressed with our cake and sweetheart table & our outside ceremony had all the beautiful touches thanks to her creativity. Our day was as beautiful as our decorations she did for us. Connie and her staff are who you want to have on your team! They bring experience, taste and style, affordability, attention to detail and that personal home town feeling. They are simply the best! Connie with A Special Occasion helped plan our wedding, and took care of every detail the day of our wedding. I was a very particular bride and had clear crates labeled with what I wanted and where. 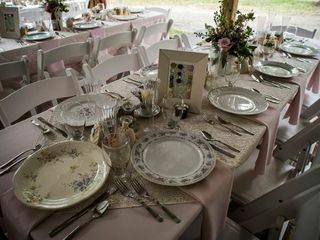 Connie and her team made sure all the linens were placed, vintage plates were placed, and everything just perfect. She is not only the sweetest lady, but she has been doing this for years. She knows what she’s doing! Our wedding wouldn’t have been complete if we didn’t have her a part of it. 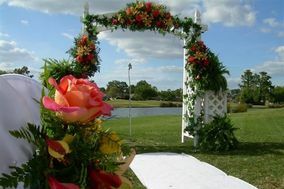 We initially contacted Connie to just order wedding invitations and after meeting with her we decided to have her take care of all of the flowers, the centerpieces for all of the tables, and the skirting for our table & the cake table. We showed her pictures of bouquets that we liked and let her design them from there. We loved the way they turned out! She showed us various options for the centerpieces and let us select which we liked best. It was nice to be able to rent them instead of having to purchase everything and not knowing what to do with the stuff afterwards. Connie set everything up and came back to get everything after the reception was over. Connie was amazing. She took my ideas and decorated everything perfectly. The bouquets she created were very beautiful. We received many compliments because of her work. Not only does she do an amazing job but her prices are very affordable. She is great! Connie and her team were of infinite assistance to us from our first contact with her almost a year before the wedding. Their professionalism was superb. Connie helped us turn our ideas into reality and at the venue, she and her team were unobtrusively in control. Even our wish to integrate Scottish traditions were taken in their stride. She was open to incorporating all of the little traditions that made the wedding so special to us. 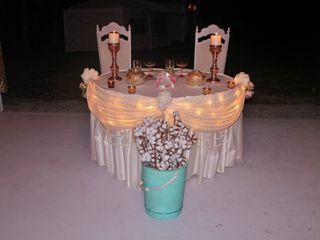 We were delighted with the flowers, the place settings, the decor, everything! Very elegant and classy invitations, superior quality and design. Fast turn around and shipping. Thanks! We had a good experience with A Special Occasion. The set-up of the wedding was beautiful. They quality of her chairs was great. The only downside was the ribbons we ordered for our favors had a misspelling on them and we didn't notice until two days before the wedding as we were tying our favors. However, I must admit I did not contact the company as we were very busy, so they were unaware of this mishap. We rented our chairs for our ceremony through Connie at A Special Occasion. Connie knew that we were having an outdoor ceremony but never mentioned that the chairs we were renting had a "leather padding." When it started sprinkling outside, we were basically told that even if we wanted to have it outside we couldn't because she wouldn't risk her chairs being ruined. I think that she should disclose this information ahead of time, because I would've gladly booked a different type of chair. I was obviously upset that we weren't able to have it outside and was trying to push to just see how the weather was going to hold up since it was still about an hour and a half before the ceremony, but I ended up having it indoors because the weather didn't look like it would hold up and I was literally not given a choice from A Special Occasion, Inc. but to move it indoors. It turned out fine and the wedding was still beautiful, but the ladies who set up/take down the chairs were just kind of standing around and staring, waiting to take all of the chairs. I think it could've been handled better.